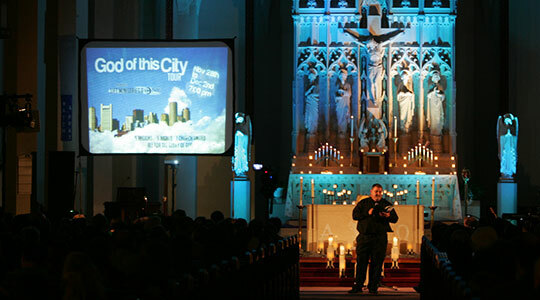 Summary of today’s show: For the past four years, Lift Ministries has taken a week in Advent for the God of This City Tour, traveling to five different churches in five towns to bring contemporary and original praise music, powerful speakers, and Eucharistic adoration to the five regions of the Archdiocese, each year ending in our mother church, the Cathedral of the Holy Cross. Next week, they do it again with their 2012 edition. Scot Landry and Fr. Matt Williams are joined in studio by Jon Niven, Heather Flynn, and Brett St. Gelais to discuss the history of the event, its powerful effect on those of all ages who attend, and what people can expect to experience if they come to one or more nights next week. 1st segment: Scot Landry welcomed everyone to the show. He noted that one year ago today was a priests’ convocation that kicked off the big pastoral planning initiative. Scot said the Office for the New Evangelization of Youth and Young Adults is now publicizing registration for the Pilgrimage for Life in January. Fr. Matt said this year Cardinal Seán will be celebrating the Mass in Washington, DC, ahead of the March for Life. He added that the cardinal has never missed a March for Life and has always made it a priority to invite young people to go with him. There will be three distinct tracks for the pilgrimage for Middle School, High School, and Young Adults. Scot said this is something every Catholic should do once in their lifetime and this year will be the fortieth anniversary. The pilgrimage is January 24-26. For more information go to www.One4Boston.org. Fr. Matt talked about empowerment in the Holy Spirit. He said he has often preached to youth about the importance of praying to the Holy Spirit. This past weekend, they had a special night on empowerment in the Holy Spirit at Immaculate Conception Parish in Salem. They concelebrated Mass and then prayed with the young people, laying hands on them, asking God’s power to come upon them. He’s still hearing stories from the kids about how they experienced the power of God’s Spirit. He said he just found out there was a young woman who was there who has suffered from scoliosis for years and has worn a back brace 24/7 the whole time. She had a doctor’s appointment today, they took the brace off, and it appears she has been healed. 2nd segment: Scot welcomed Jon Niven and Heather Flynn back to the show. He said this year if the fourth God of this City tour. It’s five nights in five parts of the Archdiocese. Jon said they started Lift six years ago and for the majority of the time have been located at Fontbonne Academy in Milton, so they wanted to make it more accessible. They also wanted to connect the five regions of the archdiocese. He said it’s almost a revival of sorts. The culmination of these five nights is at the Cathedral of the Holy Cross, the whole archdiocese praying together. On Monday, December 10, at St. George, Framingham, with Fr. Matt as speaker; Tuesday, St. Ann, Marshfield, with Jason Deramo; Wednesday, St. Joseph, Wakefield with Fr. Rick Martignetti; Thursday, Immaculate Conception, Stoughton with Fr. Paul Houlis; and Friday, Cathedral of the Holy Cross with Mother Olga Yaqob. Friday night ends an hour later than the others at 10pm. Heather said the night begins at 7 with about 1/2 hour of music, a speaker for 25 minutes or so, 45 minutes of Eucharistic adoration and then closing with more music and then announcements. The adoration is punctuated by silence, music, and prayer reflection by Fr. Matt. Jon is the music leader. Scot asked Jon what people should expect from the music. He said part of the goal is for people to have an encounter with Christ, that they would be a vehicle, that they would connect with someone in the church on a deeper level. Heather said this event was originally targeted at young adults, although they never said it explicitly, and it has become something that everyone of all ages comes to. She said the music and staging are geared toward a younger audience, they get everyone coming. Scot asked Fr. Matt if there’s a connection to Advent in the timing. Fr. Matt recounted the thinking of the original idea in getting the Lift events out to a greater audience. He said they wanted to tie it to a liturgical season. Lent is difficult because there’s already so much going on in parishes and they’re so busy. So they looked at Advent as an opportunity to bring some more of the focus that is made on Lent to Advent. Fr. Matt said the locations are chosen through an application process. They ask parishes to apply because they want to know that the parish really wants it and will really work for it and advocate for it so it’s as good as it can be. Heather said they have a questionnaire they ask parishes to submit and they ensure that all the regions are represented. Heather said there’s definitely a handful of people who come to all five nights. There are more who go on another night and then go to the cathedral on Friday. Scot asked how much variety there is each night. Jon said each night’s music is different. The band has added 8 to 10 new songs they’ve never done before, which is a lot. They also have their staples. If you come on Monday and on Friday, you won’t hear all the same music. Each night has a different speaker too with a different theme. On Monday, Fr. Matt will speaking about God revealing himself. Tuesday is God calling us for life. Wednesday is God stretching us. Thursday is God accomplishing great things. Friday is us responding to His call (cf. Isaiah 61). When Fr. Paul graduated from high school, he immediately started acting and doing stand-up comedy in New York City. He thought fame was coming his way and that’s all he wanted. However, after the attacks on our nation on September 11th, 2001, Fr. Paul’s life, like thousands others, was changed forever. Scot said it’s unusual to hear of a priest who was a stand-up comic. On Friday, Mother Olga is speaking and she’s spoken every year in the Tour. Fr. Matt said Cardinal Seán will also be joining them for a short time on Friday evening to welcome the people and offer some words of encouragement and give a blessing. 4th segment: Heather told a story about a night they had in Franklin two years ago about a man who came to the night, who was struggling with family issues. He came to the night and decided to return to his family and try to make it work out. Jon said over the course of four years in 20 parishes, they’ve set off fire alarms half a dozen times. Most of the time it was due to incense. They end up having to rush out of the church during adoration. He said it’s amazing how when people come back, their demeanor often changes. They come back more determined to adore even more. Fr. Matt said it tends to happen in newer churches which have sensitive smoke detectors while the older churches have heat detectors. Heather said one time Jon brought his guitar with him and played outside until they could return. Fr. Matt said what makes him blessed and humble each year is the dedication of the team and their servant hearts. They’re all volunteers with their own full-time jobs and they make great sacrifices all week. By Thursday they’re exhausted and they persevere. Second, the priests who come out in the midst of busy schedules to hear confessions. Confession is very important during these nights because the attendees are often moved to the point of wanting confession. He’s also heard some very powerful confessions during the tour as people are drawn by God’s mercy and called. Scot said he’s often struck at Catholic events, that they’re so fruitful to the point of encouraging people to go back to confession after a long time away. Fr. Matt said they invite people throughout the night to come. At the cathedral last year, they could have used twice the number of confessors because the lines were so long. Brett St. Gelais just joined the show. He said one of his favorite moments was in Franklin when he was a speaker. Other years, he produces the technical aspects of the tour. He loves the moment of people not sure what to expect from lights and speakers and electric guitars in a church and then to experience the power of adoration. He said those who have been going to Lift, they know what the expect. But first-timers see who the Holy Spirit guides them. The team allows the Spirit to guide them and they often don’t know exactly how everything will go. And all these elements provide an experience that people have never seen. Scot said he always hears people at events say they weren’t planning to come, but the Spirit led them there. But Scot always ask why they were thinking of not coming. Jon said it’s the same for the tour. A lot of times people have misconceptions about what it will be like. Sometimes people associate a guitar with something that can’t be worshipful. Jon said their goal isn’t to put on a show, but to reflect the light of Christ. Heather said to people who are worried about coming solo that it’s not a clique and they are always very welcoming. Every month at Lift they have new people coming. For many people it’s become a monthly meeting place where they don’t see each other at other times. Brett said if people aren’t sure they’re going to be comfortable, that’s good. We should step out of our comfort zones to experience God in new ways. Scot said part of allowing God to stretch us is to say God I trust iun you. Fr. Matt said this past Sunday marked the one year anniversary of the new translation of the Roman Missal. Ever since he’s been struck by the new line that God has chosen us worthy to stand in his presence and minister to Him. It’s a work of service and a gift of self to the Lord. As we minister to Him, He in turn showers down the gift upon us, He sanctifies His people. Lift is not the Mass, but it is para-litugical. It is based in the biblical imagery of the Psalms. Heather said that Jon and the Lift Ministry band put out an album called Glory Road, which is available on iTunes.